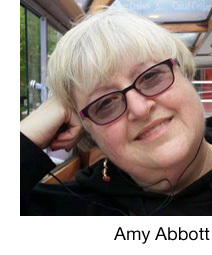 Amy Abbott has been writing essays since she could sit up straight at her mom’s Royal typewriter at the kitchen table. As a wife, mother, daughter, sister, friend, baby boomer, Abbott tells stories – sad and funny and often both in the same piece. Her work is online at www.amyabbottwrites.com or you can find her books at Amazon.com.